"They said the age of heroes would never come again." "It has to." Warner Bros has revealed a new Comic-Con trailer for DC's Justice League, and it looks totally awesome, packed with action and plenty more. Justice League is the continuation of the Batman v Superman series in the DC Extended Universe, bringing together five super-powered beings: Ben Affleck as Batman, Jason Momoa as Aquaman, Ezra Miller as The Flash, Gal Gadot as Wonder Woman, and Ray Fisher as Cyborg. The extensive cast also includes Willem Dafoe, Jeremy Irons, Amber Heard, Amy Adams, Jesse Eisenberg, and J.K. Simmons as Commissioner Gordon. As we all know, Joss Whedon has taken over finishing the movie since Zack Snyder had to step down for family tragedy reasons. As usual, there's some epicly cool shots in this worth admiring on their own. The line from Alfred about wind-up penguins is great, too. They've got my attention. Dive in. You can also still watch the first Comic-Con trailer for DC's Justice League here, or second the trailer here. Fueled by his restored faith in humanity and inspired by Superman's selfless act, Bruce Wayne enlists the help of his newfound ally, Diana Prince, to face an even greater enemy. Together, Batman and Wonder Woman work quickly to find and recruit a team of metahumans to stand against this newly awakened threat. 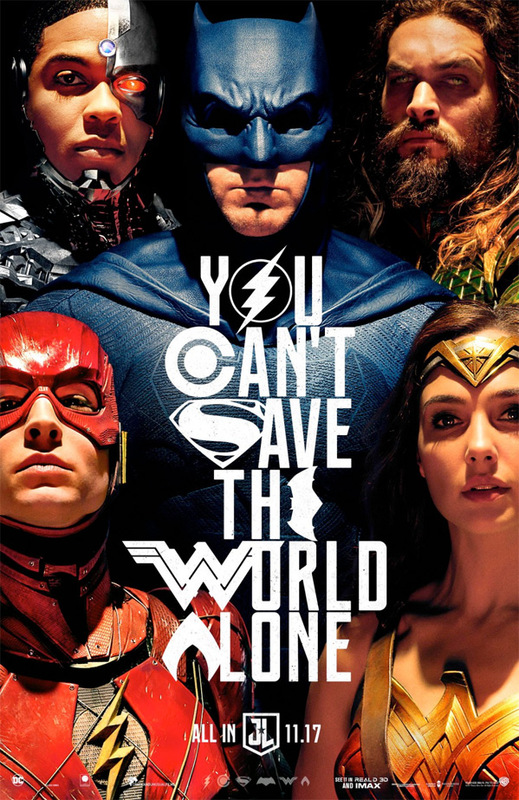 But despite the formation of this unprecedented league of heroes-Batman, Wonder Woman, Aquaman, Cyborg and The Flash – it may already be too late to save the planet from an assault of catastrophic proportions. Justice League is once again directed by Zack Snyder, of Batman v Superman, Man of Steel, Sucker Punch, Watchmen, 300, and Dawn of the Dead previously. The screenplay is by Chris Terrio (Argo). WB will unleash the Justice League on November 17th, 2017 later this year. Who's ready?